As an emotional Ange Postecoglou announced his resignation as manager of the Socceroos, his reign was sewn up with an odd, truncated sort of symmetry. Postecoglou had taken the job in 2013 with the team already qualified for the 2014 World Cup in Brazil; his successor will inherit a similar situation, with the Roos having finally qualified for Russia 2018 a week ago. candidate available. 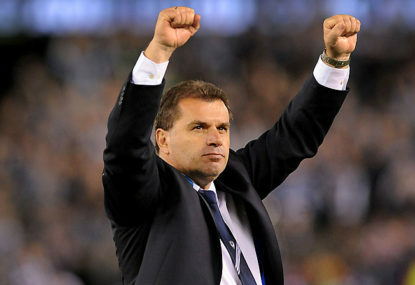 Postecoglou’s reputation – at one point in ashes after his acrid, auspicious failure to qualify for the 2007 U-20 World Cup as manager of the Young Socceroos – had risen like a phoenix in Brisbane, soaring to new, blinding heights as his Roar team dominated the A-League, playing sumptuous football and setting a code-wide winning streak record. An Ange-led rebuild at the Melbourne Victory was cut short – he was the obvious choice, the right choice, and his ascension to the national team sent warm, hopeful air rushing back into the Socceroos zeppelin. It was on short notice, sure, with the World Cup looming, but a talented, local manager was in charge now. As the anxiety loosened itself from the football-loving public, so did their expectations for the tournament loosen, especially after Australia were drawn into a horror group. The disappointment of three group stage losses, to Spain, Chile and the Netherlands, were tempered by the sight of the team playing with energy, with ambition, and with a number of new, young players glinting into view. 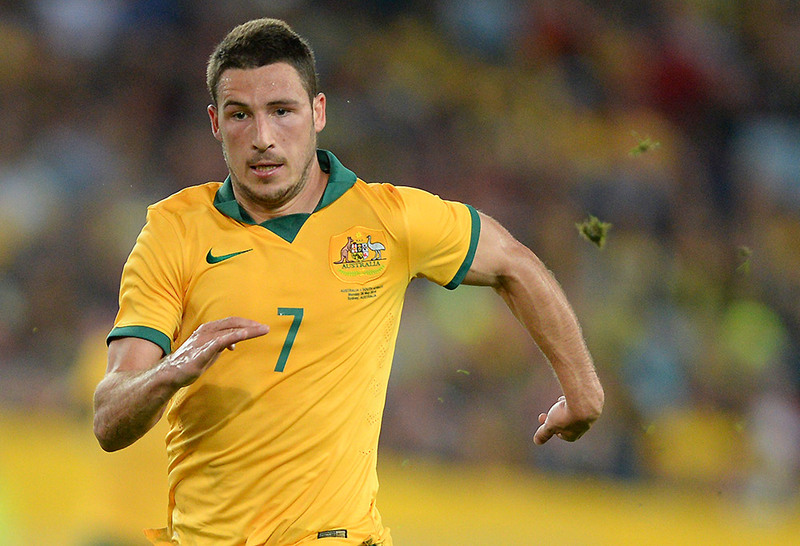 Matthew Leckie was a breakout star of that tournament, a player for whom consecutive games for the Socceroos only came after Ange’s appointment. Postecoglou included eight players aged 23 or younger in his first World Cup squad, and of those eight, at least four – Leckie, Massimo Luongo, Mat Ryan and Bailey Wright – have all proven important assets for the Roos since. He also included seven A-League players in that Brazil squad, a hugely refreshing sight for those of us who had become nauseated by the Euro-elitism of the previous regimes. Following his first World Cup, it would take a year for Postecoglou to lead Australia to the zenith of the region, winning the Asian Cup in 2015, on home soil. The team went through from group stage to final, winning four games and losing one, scoring 12 goals and conceding just two. Asian titans South Korea were beaten 2-1 in the final, a glorious triumph snatched in extra-time, and Australia were crowned Asian champions for the first time in our history. It seemed, at the time, that the true magnitude of this achievement was cushioned slightly, for whatever reason; a general sense of disinterest from the non-football sections of the country, the relatively recent entrance Australia had made into the Asian confederation, the fact we’d been runners-up in 2011, perhaps. Regardless, those for whom football beats alongside the heart, through whom football courses, carried on the blood, knew this was a conquest to be etched in gilded lettering into the memory. The sight of Ange, shirt soaked with sweat, roaring in victory, was inextricably married to this feeling. Two years on from the end of Osieck, the Ange era had already produced dazzling returns. With these riches, though, the bar was raised to a higher notch. A year of World Cup qualifiers began, with Australia rolling easily through the initial rounds, the likes of Kyrgyzstan and Bangladesh dispatched without much fuss. From September 2015 to September 2016, Australia won nine of the ten competitive qualifiers they played, conceding just four goals over those matches. But as 2016 eked out into 2017, things began to curdle a little; a drastic change in formation occurred in March, with a three-at-the-back system instated, a scheme that seemed ambitious, if a little ill-fitting. The results preceding this tactical shift had been ho-hum, with three straight draws coming against Saudi Arabia, Japan, and – most galling of all – Thailand, all in competitive group stage matches. The Roos were teetering slightly, and concerns were creeping up like rising damp; the team needed steadying, and suddenly imposing an unfamiliar tactical system was unlikely to do this. The team were struggling to fashion open-play chances, and the new formation appeared vulnerable to sudden counter-attacks. There was increasing criticism of some of Postecoglou’s personnel selections and his reluctance to be tactically pragmatic, with automatic qualification from the group stage edging further and further away. Postecoglou was not helping things either, having earlier welcomed – encouraged, even – an increased scrutiny on team tactics and selections, insisting this was the norm for a healthy, engaged footballing nation. He had also preached the importance of playing time when making selections, and yet was regularly selecting players who were being paid to warm pine at their clubs. As the criticism intensified, Postecoglou became increasingly defensive and prickly. He, perhaps rightfully, had expected a little more faith, with the Asian cup not yet dusty in the cabinet. The Confederations Cup came and went, with Australia managing two draws and a defeat to three quality opponents in Chile, Cameroon, and Germany. Postecoglou had insisted his tactical system was designed for higher-level play, for competition environments, and the fact it was less-suited to the slog of Asian qualifying was a downside that had to be tolerated. The Confederations Cup offered a scrap of evidence that this might indeed be the case, although the manager chopped and changed his starting XI liberally throughout the short tournament. A crunch away match against Japan loomed as Australia’s – and Ange’s – first opportunity to soothe concerns, qualify automatically, and in the process seize the end that would justify the means. They couldn’t, losing 2-0 in Saitama, playing in the same, defensively questionable manner. As the Japanese celebrated with the fans, it was critical that Australia recorded a dominant victory over Thailand in their final group match; a three or four-goal margin would send us through. The match against Thailand – a team playing entirely for pride at that point – was an excruciating exercise, with Australia missing chance after chance, hitting the post three times, and eventually winning 2-1. The Socceroos had now failed to register a clean sheet in 11 of their last 12 games. The narrow win was not enough, as Saudi Arabia beat Japan in Jeddah later that evening, relegating Australia to third place in the group and consigning them to a pair of two-legged playoffs. Syria, then Honduras, were next, and the pressure was ratcheted up another few tortuous notches. Every decision Postecoglou made would now be callously dissected by a jaded footballing commentariat, some of whom were already calling for his head to roll. The Syrians were eventually overcome over two ragged legs, a scored-draw in Malaysia and an extra-time victory in Sydney, in which the width of Mat Ryan’s post was almost as important as Tim Cahill’s late winning header. Honduras were next, a team with a fearsome reputation for a physical style that tiptoed down the line of legality. A 0-0 draw in San Pedro Sula, hacked out on a cow paddock, set up an all-or-nothing second leg. Neon rumours that Postecoglou would resign regardless of World Cup qualification throbbed along in the background as a problematic distraction. It seemed as though his entire legacy was resting on this result. Honduras, eventually compelled to emerge from their defensive stance after Mile Jedinak’s deflected opening goal, turned out to be a terrible team, with no attacking scheme to speak of, and were downed 3-1 in the ultimate game. Australia had done it, finally, and a place in Russia was confirmed. Postecoglou floated around in the aftermath, buoyant and relaxed, Atlas suddenly relieved of the weight of the world. He refused to confirm whether he’d stay on for the tournament proper; at the time, it seemed as good a sign as any that he would not, and this was confirmed yesterday. Had Australia failed to qualify, it would have been difficult to summon much remorse over Ange’s resignation. Osieck was sacked having just achieved the goal of World Cup qualification with relative ease, a minimum standard Postecoglou had to labour so haggardly to. But the fact he eventually succeeded means we will look back on the Postecoglou era through slightly rosy lenses; a final, harrowing collapse would have – unfairly – concealed the fond memories, the historic triumphs. It will not now, and a good thing too. David Gallop, sitting alongside Postecoglou in his final press conference, said he was puzzled by the decision. Indeed, with all the talk of how this qualifying campaign was some sort of difficult preparatory school for the big tourney next year, where the fruits of this trial would be found, it is puzzling that Ange is choosing not to see it through. His relationship with his family, though, rightfully takes preference. One wonders where Postecoglou will go next; surely a club position in Asia, or perhaps Europe, is what Ange is thinking of now. The pressure he’ll suffer under there may well be as intense as the scrutiny he has endured over these last six months. For all of his flaws, for all of his infuriating foibles, and as taxing as this qualifying campaign has been, Ange Postecoglou has been the Roos’ finest Australian manager, perhaps their greatest ever. As the sour memories of Brad Smith and the back three fade into the soothing greyness of the past, it’s the wonderful peaks of his tenure that will catch and keep the light, glimmering on into the future.